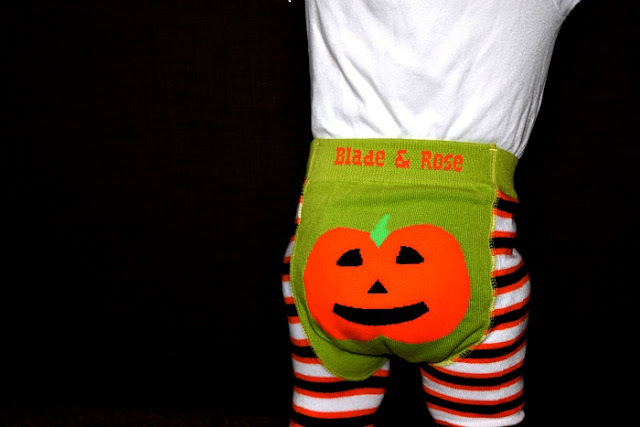 I am a huge fan of Blade & Rose leggings. I love to see babies wearing cute yet comfortable clothes. Elsie is still at the cruising stage. She is climbing up every surface but to actually move around she opts for crawling and so thick leggings protect her knees and don't restrict her movement. 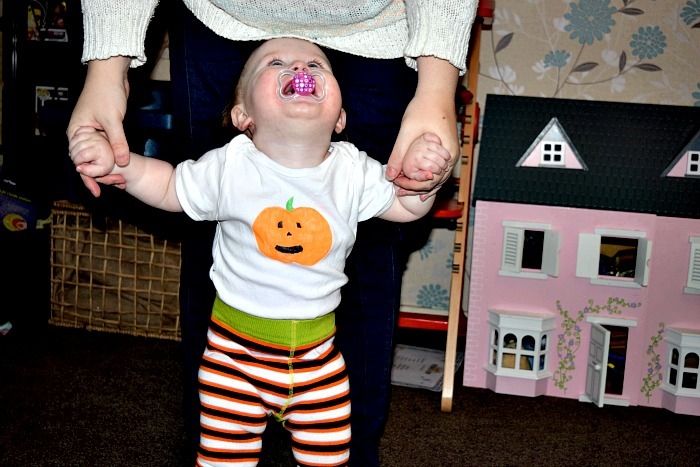 I wanted a simple but cute outfit for Elsie to wear for our little party we are holding on Halloween and so I thought these lovely Halloween leggings from Blade & Rose would look great with a quirky home made vest/top. I won't lie the top was harder than it looks. I actually ruined the first one being too generous with colour when colouring the eyes. It looked perfect then I saw the black running and running until my pumpkin looked like it had been crying with too much mascara on. Second time around I did the eyes smaller and used the colour sparingly. I drew the outline of the pumpkin lightly with a pencil, popped some card inside to lean on and to protect the back of the vest being soaked through with colour. I then used GIOTTO textile pens to fill in the colour and draw the finer details. I think the top looks really cute and doesn't take away the attention from the leggings. It will look fab with some Pumpkin headband boppers for our Halloween party! You can find out more about Blade & Rose or shop their collection at www.bladeandrose.co.uk.